In the previous pAsuram, mAmunigaL celebrated the greatness of AchAryan by saying that it is because of his grace that he is uplifted in the first place. In this pAsuram, he describes it in more detail. nenjE – hey my heart!!! vandhu – and came to the place where we were. uyyakkoNdu – were approved by his grace and were deemed “upliftable”. In this pAsuram, mAmunigaL celebrates the greatness of his AchAryan. He says that it is because he came to the place where he was and gave thirumanthram, he was able to be a servant of the servant of the Lord srIman nArAyaNan. The greatness of thiruvAimozhip piLLai is described first. “thiruvAimozhi” is a divine prabandham that is a nector to all devotees of SrIman nArAyanAn (who are SrIvaishNavas who are also known as bhUsurar (the celestial beings of this world)) as nammAzhvAr himself said “thoNdarkkamudhuNNach chol mAlaigaL sonnEn (thiruvAimozhi 9.4.9). 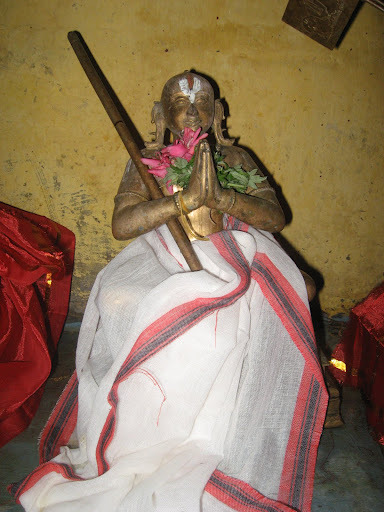 thiruvAimozhip piLLai is an AchAryan who used to breathe thiruvAimozhi and live in it. He enjoyed the different types of nectarines in it namely nectarine that comes from the arrangement of words, nectarine that comes from the meanings and the nectarine that oozes from sheer passion involved in the pAsurams. He lived by the purport of thiruvAimozhi and considered all other SAsthrams to be like grass. He performed all types of kainkaryam to nammAzhvAr at all times by surrendering to his lotus feet. Since he was known to the world by his association with thiruvAimozhi, he became to be known as “thiruvAimozhip piLLai”. mAmunigaL says to his heart “hey my dear heart! Look at us. We verily represent the cloud of cruel sins as described in the phrase “oppillAth thIvinaiyEnai uyyakkoNdu (thiruvAimozhi 7.9.4)”. thiruvAimozhip piLLai incarnated as AchAryan and liberated us”. mAmunigaL himself quotes this in his upadhESa raththina mAlai pAsuram as per “thEnAr kamalath thirumAmagaL kozhunan thAnE guruvAgi (upadEsa raththina mAlai 61)”. mAmunigaL continues, “He came to the place where we were and gave us the knowledge that has its genesis from thirumanthram. This is different from the knowledge that stems from other SAsthrams. Hey my heart! Is it not because of this great opportunity that we were uplifted and got the golden opportunity of serving our master emperumAnAr? In fact it is and it is the only reason why we even got this opportunity in the first place. The highest meaning that is conveyed in thirumanthram is being servant to the servants of the Lord SrIman nArAyanAn. It is because of realization of this fact, that we in fact became eternal servants of emperumAnAr”. This entry was posted in Arththi prabandham, Other and tagged arththi prabandham, mamunigal, ramanuja on March 8, 2017 by santhanam rajagopalan.